More please. More please. More please. 'Nuff said. Wow did my gal pals and I have a blast at the Material Worlds Fashion Show!! As I said: MORE PLEASE! It's so exciting for those of us that appreciate fashion watch as Pittsburgh takes a few steps towards its place in the fashion world. To that I say: MORE PLEASE! I knew once the Iris Van Herpen exhibition got picked up by the CMOA there were going to be some fun events in collaboration with her work. And I was right! I was able to take my time and peruse all of Herpen's stunning and artful creations. I attended an all-girls, all-fun beauty event at the Gilded Girl Beauty Emporium in collaboration with the CMOA, in which I was able to learn a new makeup technique that I used for my look at the runway show. And then there was the runway show. What. A. Night. Photo Credit above: Andrew Rush / Post-Gazette. My friends and I arrived early for a dinner reservation at the Whitfield at the Ace Hotel, followed by drinks and fanfare in the VIP lounge in the upstairs ballroom at the hotel (you know I'm VIP all the way, dahhlings). And then the fashion show began! These brave and creative designers had 3 weeks (3!!!) to not only come up with designs but put them together and get them down the runway. All were amazing, but I'd have to say my faves were tied for their creativity and artistic approach. Atticus Adams' designs floated down the runway with his metal fiber creations. You would think these creations were inspired by Herpen's metal fiber designs but you'd be wrong; this is Adams' signature material in his sculptures and installations and I can't tell you how much I loved his work. So thoughtful, creative and certainly fashion-forward. I'm just going to apologize right now for my photos (I even stole one from Mae). I promised myself I would not take a camera because I really wanted to enjoy myself so I only used my iPhone. 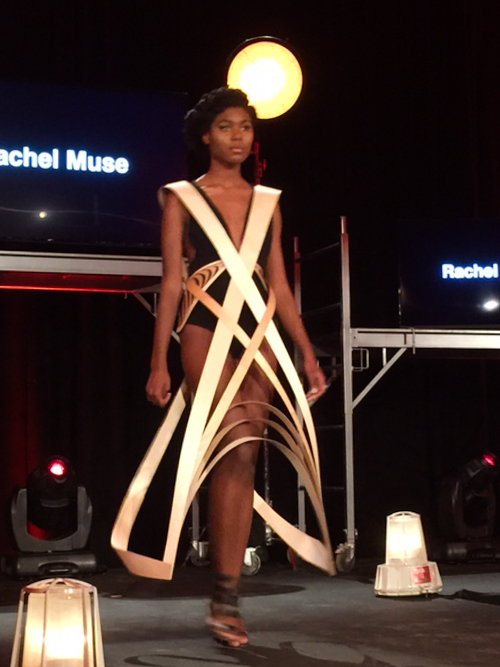 The other designer I fell in love with was Rachel Muse. Looking at her work you would not be surprised to hear that she's a student at CMU majoring in architecture. Her creations were just so coooooool. I had about a million different ideas pop through my mind of how I would photograph them, and the same for Adams' creation as well. Gosh would I have a field day. Yes, that's wood you see. 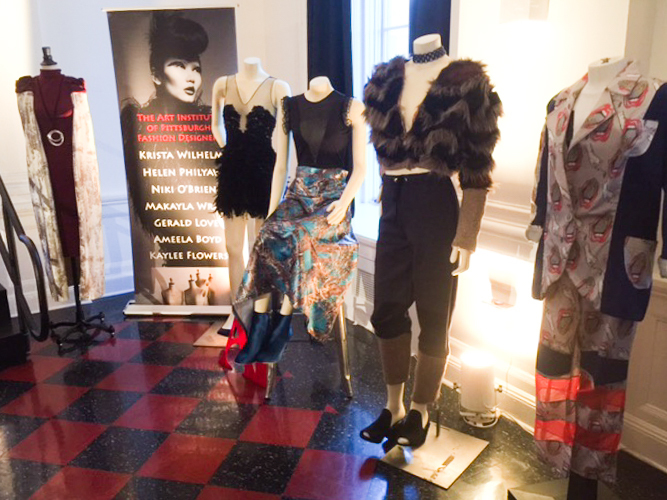 The other designers brought their very best to shine as well. Lea Albaugh, Memphis George, Stephanie Moye, Brandon Darreff and Zain Islam-Hashmi, Sarah Jane Sindler, Richard Chou and Chengcheng Zhao, Julianne D'Errico, So-Hee Woo each showed up to play hard, and play hard they did. OK...these women. I want to be them when I grow up! You can't see the details of their outfits but trust me, they were divine. Watch Me on KDKA's Pittsburgh Today Live!